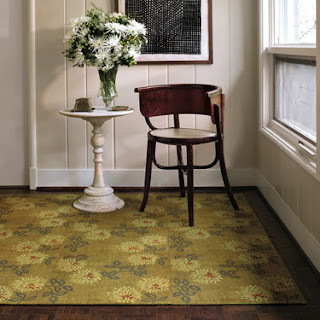 Behold the gorgeous Mums the Word area rug by Flor. Isn't it lovely? You can win one over at Mums the Wurd, where I wrote about my Flor addiction. Go on over and enter to win one now! It would liven up any room, I think. I would love to see it in my home. I want to be addicted to Flor, too! Wow, that is very different for Flor and a very nice addition to their selection. Pretty. I love that rug! I almost picked that one for the one that I did win, but wasn't sure I could make my furniture go with it.